We had a hill out back of our house in Lincoln Co, WV that would come alive with laughter when the snow was deep enought to sleigh ride. Basil would build a big bondfire in the middle of a large field and all the kids and neighbors were ready to have some fun. Everyone was bundled up with two pair of pants, toboggans, gloves and heavy coats. 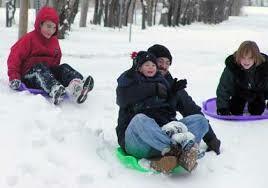 Even the mom’s and dad’s were climbing to the top of the hill and doing a belly buster on their kid’s sleigh. We would be outside for hours just climbing, sledding and then back up the hill. I found a recipe back in the 60’s that we named B. Y. F. Cocoa Mix. (Baptist Youth Fellowship). 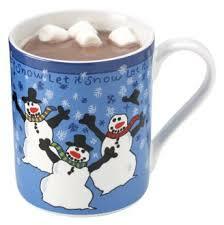 This was also the hot drink I made for all the people that were sledding in our back yard. Add 1/3 cup of the dry cocoa mix to your cup and add hot water. This is the BEST hot chocolate drink you ever tasted. It is an excellent recipe and will keep several months in the sealed bowl. Great for gathering of youth in the winter or holiday gatherings. Please let me know if you make the mix and if you liked it. Thanks for finding me & commenting! I’m glad to find a friend who can celebrate West Virginia with me. 🙂 Blessings to you & your family this holiday season. Hi! I just wanted to say “thank you!” for leaving such a nice comment and taking the time to view my blog! This cocoa mix sounds too yummy not to make, so after I’ve sipped on it I’ll let you know how great it is!! I had a chance to make the cocoa last night and it’s delicious! We added more cocoa mix b/c our family lovessss chocolate! Thanks for the recipe! Jen: I am glad you like the cocoa. This recipe make a lot of the mix and you will have enough for all the friend and family. I have used this mix to make a Christmas gift jar and tired a ribbon around the top. Just tape the directions on the jar and you have a wonderful gift. My grown son was visiting last night and suggested I make some Cocoa Mix.